Special Mass at the Cathedral with Archbishop on June 28th at 5:15 p.m. 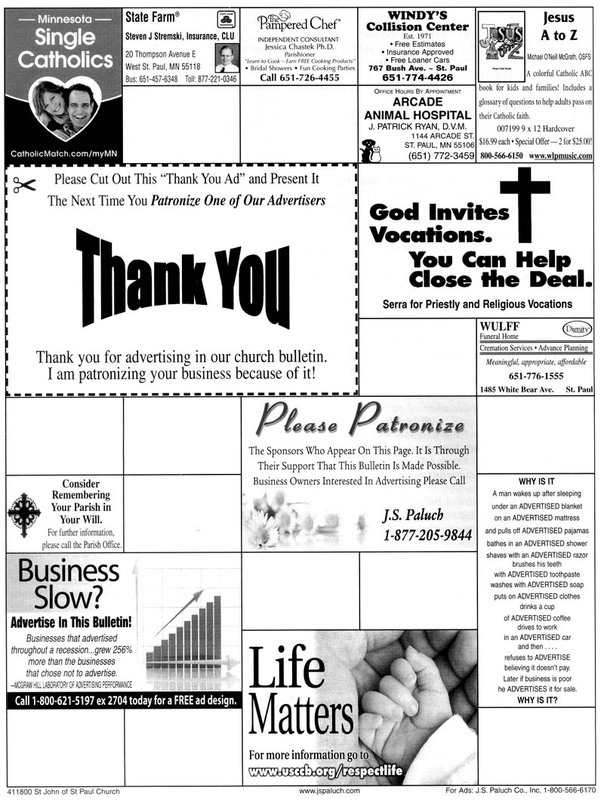 When I was a kid in the small town of Valmeyer, Illinois (population 600), the Fourth of July had a connection with religion, at least in our parish. You see, our parish festival was always held on the Fourth of July, so this was one of the noteworthy days of festivities during the summer, and it was in sort of a convoluted manner. Now, as a much-older adult, I'm being asked, as every Catholic in this country, to make a connection between the Fourth of July and Freedom of Religion. The reason is quite simple. 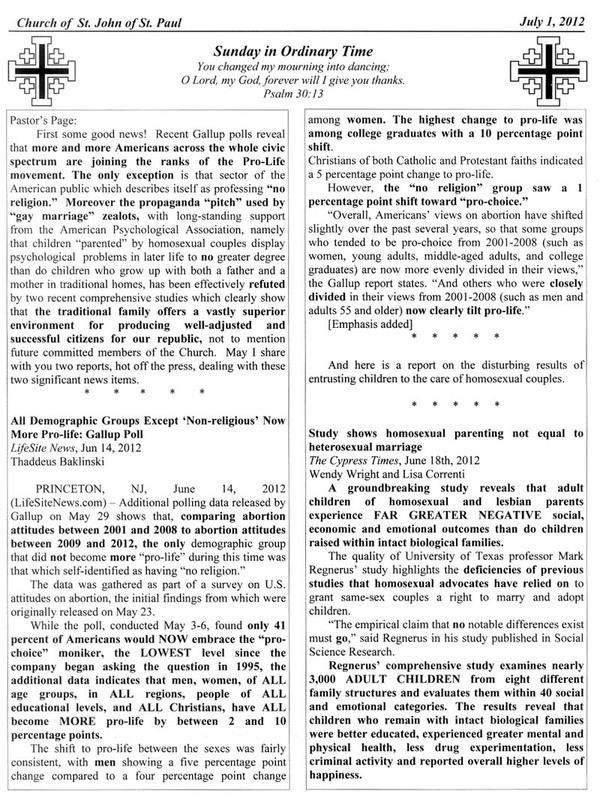 Our freedom of religion is being threatened by the proposed Health and Human Service Mandate which goes into effect on August 1, 2012, and Catholics and Catholic institutions are being mandated to act against their consciences and policies by purchasing insurance which pays for abortion-inducing drugs, sterilization, and contraceptives. So the United States Bishops have asked all Catholics to observe a "Fortnight of Freedom," in which prayer, study, catechesis, and public action will take place to heighten the awareness of Catholics and other citizens of the injustice that is being proposed, and, of course, to beseech the Lord to reverse this mandate. "Fortnight," in case you might be unfamiliar with this term (don't feel bad, it was only in more recent years that I knew what it meant), means two weeks, so the beginning of the Fortnight is June 2lst, the vigil of the feasts of St. Thomas More and St. John Fisher. What great saints for this problem! Here were a politician and a bishop in England who would not bend to the wishes of the King (Henry VIII). Both were martyred rather than violate their consciences. Both are examples for Catholics in the United States, who may be called to obey the higher laws of God rather than the laws of the government, if they conflict. During this two-week period, on Thursday, June 28th, at 5:15 p.m. at the Cathedral of St. Paul, Archbishop John Nienstedt and Auxiliary Bishop Lee Piché will celebrate a Vigil Mass for the Patronal Feast Day of this local Church, the Solemnity of Saints Peter and Paul, two other martyrs for the Faith. Everyone is welcome and encouraged to invite their family and friends. 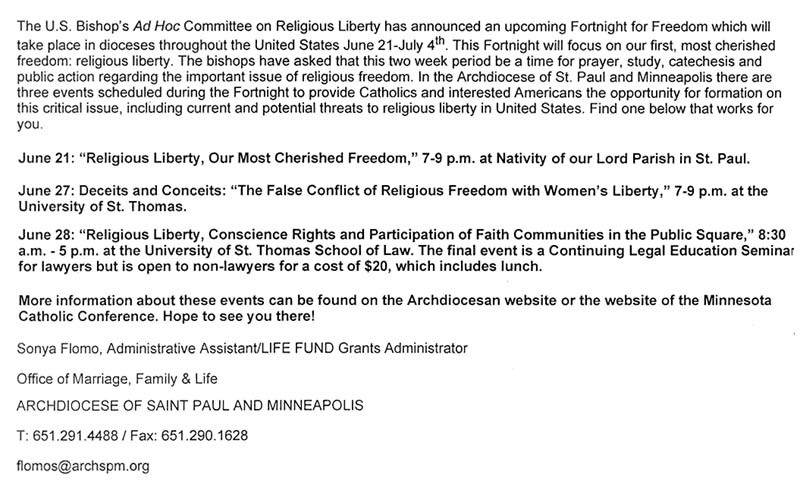 During this Fortnight, the Minnesota Catholic Conference will be sponsoring a lecture series on religious liberty at various Catholic institutions. For more information click on www.mncc.org and then click on "Up-coming MCC Events." 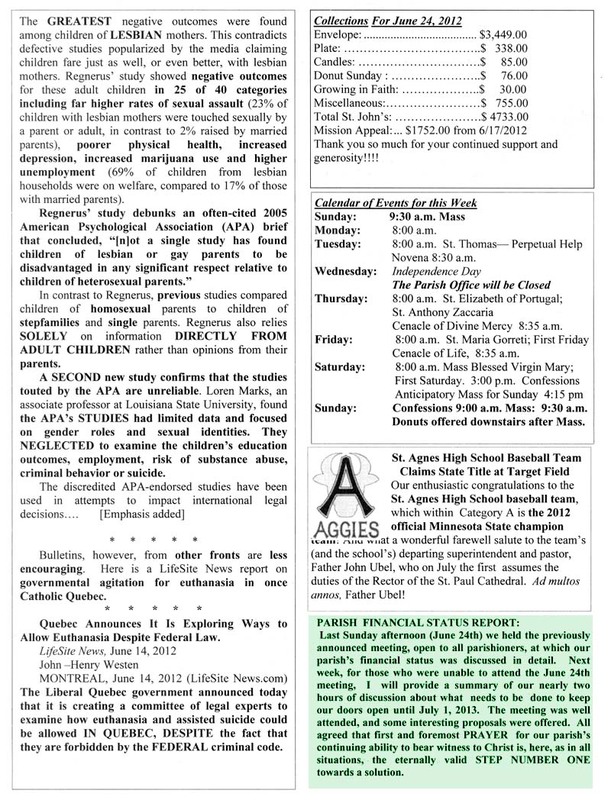 (Or consult a separate insert in today's bulletin). Of course, the Fortnight ends on July 4th, Independence Day, with a grand celebration commemorating the freedoms for which many of our ancestors have sacrificed. The bishops are reminding us that we, too, may share in that sacrificial heritage. "Let freedom ring!"